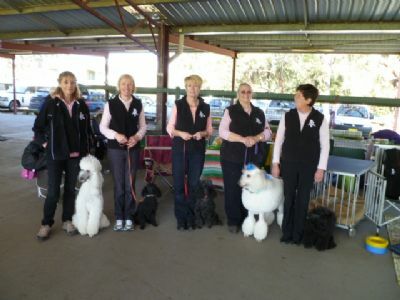 The NSW Inter-club Obedience Challenge is an annual event where representatives of obedience and breed clubs across NSW compete in a teams event format. 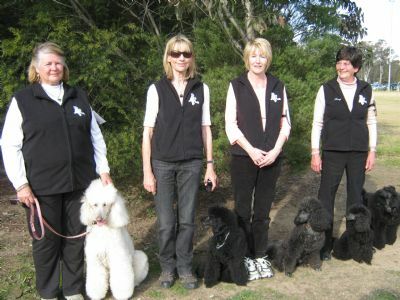 Our team in 2010 pictured above (left to right) included Bernice Monteith, Anne Fitzgerald, Helen Pakalns and Sheryl Lindsay and their fabulous Poodles. The team won the category of Highest Scoring Breed Club. Pictured below is our 2012 team (left to right) Anne Fitzgerald, Catherine Crouch, Helen Pakalns, Bernice Monteith and Sheryl Lindsay. PCNSW was represented again in 2013. It's a wonderful opportunity to demonstrate the versatility of our breed as well a good way to have some fun. Here is our 2013 team.